Critically endangered turtles seldom seen on Florida's shores are the focus of Larry Wood's study at the Palm Beach Zoo — and likely to be spotted on a scuba dive he's leading Saturday. Even if the hawksbill turtle is elusive outside of the area's waters, Wood's research has found that the reptile is plentiful – and one of the most consistent residents – in the reefs off Florida's coast throughout the year. And the Palm Beach Zoo conservation biologist is hoping to learn more about the young ones that grow up around here — and why they are attracted to these particular reefs they feed on. Over the last 10 years, he's tagged 175 hawksbills and some of them should start getting that urge to mate and nest soon, which will lead them to leave Florida's waters, he said. He's hoping to find out more about what shore they show up on to lay their eggs. "It's an interesting species that we still know little about, especially in Florida," Wood said. "I'm anxiously awaiting that call from somewhere that they've found one of my turtles. I'm thinking somewhere in the Yucatan." The turtle doesn't have the gargantuan size of the leatherback turtle or the distinctive green of Florida's other frequent beachcomber, the green turtle. But its shell has made it one of the more exploited of the sea turtle species. When jewelry has what's called "tortoise shell," it's usually comes from a hawksbill, Wood said. "Throughout human history, there's been a premium value for their shell," he said. "It's been incredibly important to economy and trade throughout the world." Its flesh is also considered a delicacy in some countries. The Hawksbill Project has been a part of the Palm Beach Zoo's conservation efforts for more than a decade. "They are hugely unique to this area and since we are a conservation society, we want to support these initiatives that Larry is working on," said Andrew Aiken, president of the zoo. Funding from the National Save the Sea Turtles Foundation paid for turtle transmitters that are showing Wood what the turtles are doing in real time. He's been surprised to discover that, unlike many sea turtles, the hawksbills have a singular place in the reef where they go to spend the night. The foundation is also sponsoring Saturday's dive to lower the cost for participants. Frank Wojcik, executive director of Fort Lauderdale-based foundation, said his organization likes to support encounters that bring locals face-to-face with the ancient reptiles, some of whom have roamed ocean waters for more than 100 million years. 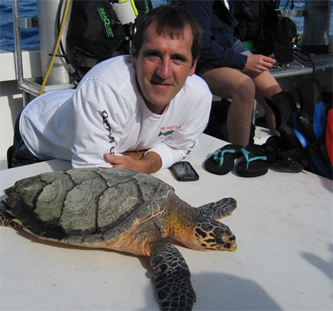 Larry Wood, a Palm Beach Zoo marine conservationist, poses with one of the hawksbill turtles found off Florida's coast. They are plentiful in the ocean, but rarely seen on Florida's beaches.